Until land is finally breached and blessed. Feed their fever, follow their compass. Mate between the purpled tongues of seaweed. With the half-shells of razor clams. With a sharp rock and muttered chants. 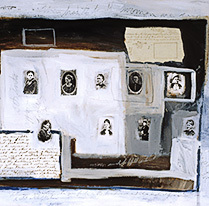 With their limited palette, these collages could represent any history of families that migrate and settle in unfamiliar lands. As an American of European heritage, I know little of my own family’s past but can imagine the shocking shifts from a “civilized continent” to the threatening sphere of the “wild west”. 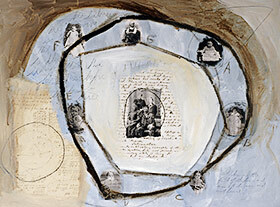 Though some of the paintings on 600gram watercolor paper are more “American” than others, the overall quality is a general look at ancestry, emotions and relevant accompanying moods. Handwritten excerpts from imaginary diaries compete with simple geometric shapes culled from an 18th century geometry workbook. 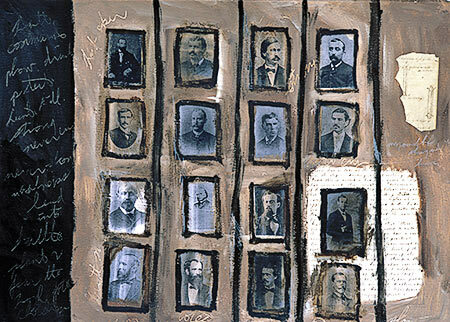 My own photographs entangle with those of my ancestors or those anonymous souls bought at flea markets.